As a developer, I’m always on the lookout for applications to help me work better or keep my focus. I use apps for everything from checking email to instant messaging and updating social networking services, but there are a few applications I use on a daily basis that make my life easier and more productive. Applications can make life easier when you’re working as part of a team, and this is especially true when team members are spread out across the country or the world. My team uses Skype because it provides an easy-to-use means of communicating with clients and other developers in real time. During our weekly iteration meetings, we use the screen-sharing feature to give the client a detailed look at what we’ve been working on. It also allows us to send documents back and forth, so the client can keep us up to date on project specifications. Skype can even be an invaluable tool for collaborating with other project developers to figure out problems in the code; instead of having to describe the problem through text, we can take a screenshot of the issue and send it for more rapid feedback. For taking those screenshots, Skitch is fantastic. You can take a full-screen snapshot, or you can use the crosshair tool to select only what you need. Images can be annotated with a variety of drawing tools or text, and then the images can be uploaded to the Skitch website and shared. I’ve been able to save a lot of time by using the arrow tool to point out a specific line of a stack trace, making it much easier for teammates to quickly get up to speed with an issue and figure out a solution. Together, Skitch and Skype make a powerful combo for keeping teammates up to date on any project developments or issues. Things is one of my favorite applications for one reason: It helps me keep track of what I need to do and when. I can set up single tasks, or create repeating ones for things that happen periodically. For example, I have events every month that remind me to pay bills so I don’t come home to discover that my power has been shut off. Things gives you the option to postpone tasks, but getting the number of things in today’s list down to zero is a way of life, much like Inbox Zero. We all know that it can be difficult to be productive while connected to the internet. How many times have you hopped on Facebook for a moment, only to discover that an hour has passed and you haven’t actually done anything useful? Rescue Time gives you a better idea of how you spend your time at the computer by monitoring how long you use different applications. When I first started using it, I was suprised to learn that I was spending more than 15 hours a week on social networking sites. Checking Rescue Time now tells me whether I have been getting enough work done, or if I need to buckle down a bit and be more productive. I’m not the only Nerd who loves it–we’ve written about it before and even given a Tech Talk about it. Apps are a double-edged sword. They can give you access to social networking sites and turn into a huge time sink, or they can help you manage what you need to do and when you need to do it, while keeping you in contact with those people you are doing it with. 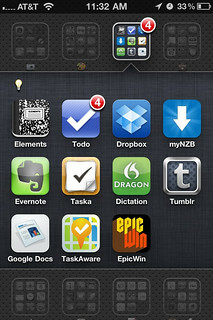 Which applications improve your productivity?